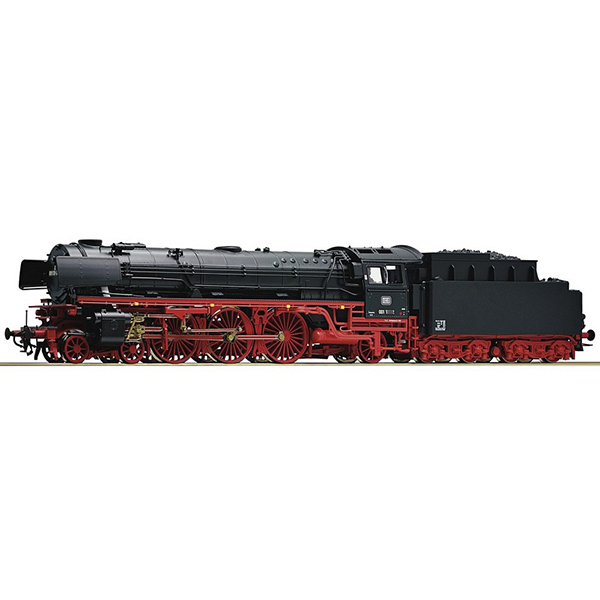 Steam locomotive class 001 with new boiler of the German Federal Railways. During the war the locomotives were not properly maintained and this was dramatically apparent on the express train locomotives of the series 01 from 1940 on. The vehicle fleet initially had a large number of locomotives of the series 01 available but, later, only about 160 locomotives in adventurous technical conditions, could be put into operation. When the locomotives were providing their daily hard services, however, it became clear that extensive maintenance work was necessary on a long term basis for a stable operation. Thanks to many years of experience, however, many locomotives could be kept in operation until the 1960s. By the end of 1958, however, the decision was made to put 50 locomotives on a conversion program until 1961. Not only a new boiler with a combustion chamber and new ash boxes needed to be fittet but also the rusty surfaces had to be repaired. The water supplying dome and the sandboxes and many more were also removed. This completely changed the look and the design of the locomotive. Interface: Electrical interface for traction units according to NEM 652 standards with plug-in fixture.